I screamed as I held my head in desperation while staring at our 4×4 completely stuck in the mud. My body trembling, my mind already flying, thinking about all the possible most tragic outcomes of this unlucky situation. The time was around 3 to 4PM. The location: Moremi Game Reserve, not far from the Mogogelo Hippo Pools. Around five hours back we had woken up in the Savuti Camp in Chobe National Park and headed over to Moremi. On the gate we asked for the best areas to visit as we knew some parts could be flooded. We saw in our Tracks4Africa map that towards the South Gate there was a what seemed like waterholes, know as the Black Pools. They seemed worth checking out. We began driving and quickly the dirt road become an almost unmarked grassy path. At some points it was hard to understand if we were actually following the road or not. We saw some zebra, but not much was around. We continued, longing to see hippos on the water. From afar, we saw what seemed like hippos and decided to get closer to them. We followed the map to get to the path that surrounded one of the pools and we saw four of them, resting in the water. “Let’s go to the campsite now” we said. We continued the path but noticed it was a bit muddy. We had got stuck and were rescued earlier that day so we both agreed. “Let’s turn back and go the other way”. But going straight was shorter, so we got off the car to look and try to find a dry patch. We found it, went forward and failed. We somehow ended up stuck in deep, deep mud and water. “We are stuck. Really stuck. There is no way of getting out of here without help” my boyfriend said. “What are we going to do!!! No one is going to find us here” I screamed. We were on the middle of freaking nowhere and it was now closer to 5 PM. No one was going to find us. As I said before, the path was barely marked. We weren’t even sure where it lead. It seemed to be marked in the map, but it was impossible to know for sure. The car was surrounded by bush. Even a few meters away, the car was already out of vision. Even someone 100m away could fail to see us. We remembered that Hertz had included an option called “Hero” were they would rescue you from anywhere in case of emergency, by simply calling a phone number. When they pitched it to us, I quickly said: “But you don’t rent satellite phones and there won’t be any signal where we are going”. The Hertz rep responded that we could always call 999 (Emergencies) despite having no signal. He said he was sure it would work. Stuck. The only photo we took from the misfortunate event. We called 999 desperately, but nothing happened. I knew it all the time, but I just hoped nothing this terrible would happen. I started digging water and mud from the wheels with the pots and pans we had on the car but I quickly realized it was useless and gave up. There was no way that the car was getting out of there without another calling pulling with a tow rope. No way. So, we decided to pitch the tent and go to sleep as soon as the sun came down. We had enough food to eat semi-normally for two or three days, and for more if we were to ration it. Not everything was lost. We still hadn’t decided what our plan would be. But, when we were setting up to sleep a visitor came by. It was a huge male elephant. His tusks were as gigantic as he was. He didn’t look happy to see us, he trumpeted and came directly towards our car. “Get in the car” we both said to each other. The elephant was practically two meters from the car. I still hadn’t managed to close the door. I tried to do so as quietly as possible. Elephants can turn cars upside down with barely any effort. We were preparing for the worst, but he turned around and left. The relief lasted two seconds and we were in no time discussing our options again. “We will need to walk at some point” my boyfriend said. As scary as it was, it was true. We could wait there but once food and water were gone, we would have to walk. Looking at the map, we calculated we were less than 10km on foot from the main dirt road were cars do circulate. There wouldn’t be tons but we would definitely expect to see at least one during the day. We were 20km on foot from the South Gate, where we knew help was guaranteed. We started thinking about walking as something that would actually happen. The list of animals that could harm us was long: Elephant, Buffalo, Hippo, Lion, Leopard & Rhino… We knew that if any of them decided to attack us, we didn’t stand a chance. On one hand we were extremely scared. On the other hand, we remembered our bush walk in Kruger where the ranger, who always carried a gun, mentioned he only had to use it once, with a buffalo and that he thinks he could have avoided firing it. We agreed that waiting at least one more entire day would be the most sensible. However, we both new that it was useless and that we would end up walking the day after anyways. So we decided to walk the next day. I spent the worse night of my life. The demons in my head wouldn’t let me sleep, making up a million different tragic endings to this story. I tried to get away from them but it was just useless. The variety of animal noises coming from outside which, except from the hippos, I couldn’t fully recognize didn’t help. To make things worse, it started bucketing down outside. Rain would bring more mud and make the car more stuck. If there ever was hope of the mud drying out, it was gone. We woke up when the sun came out. My boyfriend cooked a meal but the nerves twitching my stomach prevented me from ingest anything but water. We had to wait until 10AM which was the safest time to start walking as most dangerous animals are active at night, dawn and dusk. Leaving at 10 gave us enough time to make it to South Gate. We took a small backpack with some water, food, phone and one wallet. We dressed as camouflaged with the bush as we could. A bread & kitchen knife on each of our hands. And we started to walk. Danger was close, as we saw hippos in that pool the day before. There was hippo poop and tracks everywhere. Hippos are the deadliest animals and responsible for most human deaths. This is because they are protective of their territory and if they think you are threatening to steal their pool, they won’t give you a chance. We tried to get as far from the water as possible. We saw two hippos in the water but we had seen four the day before, so the others would need to be close. It was quite sunny and hot, so they would most likely be in the water. We could hear some hippo trumpeting so we proceeded with caution. Once we had steered clear from the hippos, we stuck to the path, walking together sometimes holding hands in order to appear as big as possible. We were constantly checking the tracks on the path to see what animals had been there and where they were going to. As it had rained, all tracks present were fresh. We were also constantly trying to find trees which would have decent height for us to climb up if we saw anything threatening. We saw elephants but they were far far away so we weren’t in danger. On the next hour a few bird noises noises startled us, but we didn’t see anything other than impalas, who kept running from us. A few minutes later, we saw quite a big male wildebeest who did not take his eye off from us. Wildebeest aren’t dangerous unless they stampede. Just to be safe, we walked through as far from him as possible. On the next hour we kept seeing lion tracks going to the same direction as we were. We kept watching them to see if they stopped at some point, which meant they had gone into the bush and could be on our sides, but they kept going. We had now walked more than one and a half hours and we were on the main dirt road. I could see fresh wheel tracks on the floor from what seemed to be two vehicles. We had missed them! To be honest, the fact that nothing had happened so far had us a bit relaxed. We both realized this and kept prompting ourselves to stay alert. We were still in danger. The walk continued. We saw giraffes on both sides of the road. Terrified from our presence, they run away. Every animal we run into and saw, was already aware of our presence and alert, even if they were miles away. Again, if something wanted to harm us, we didn’t stand a chance. Suddenly, a rambling noise startled us. It took a few seconds, but we could recognize it was a car. I put the knife down, breathed and waited. “We are saved!” I thought. Our saviors were a lovely couple of Colombians who couldn’t believe their eyes when they saw us walking in the middle of the road. They made a space in their cramped 4×4 for both of us and told us we had been lucky, as they had just pass a buffalo herd. Let’s best not imagine what could have happened there! They took us to our car which was probably 35 minutes away. Once there, they pulled it off the mud with a tow rope. It took a few tries and lots of force from their 4×4. We then drove back to South Gate and left Moremi. Later that day, what had happened hit me and anguish invaded my body. It took a few days to wipe the fear off. How I survived? It was not because of skill. The recently acquired knowledge on our organized safari in Kruger helped, but really, the odds were on our side. I’m disappointed with my poor planning. I should have done whatever possible to get a satellite phone. I didn’t take it seriously enough. So if you read this and are hoping to go on a self-drive safari in Botswana soon, I hope my story has helped understand how wild things are out there. Despite this scare, I still loved and recommend the self drive experience in Botswana to all wildlings out there looking for some adventure, but I learned you really need to be prepared the hard way. I’m really looking forward to go back, now to the Central Kalahari Game Reserve, now with a satellite phone! I do have to say, I am also happy that I am here to tell this story. After a great time in Victoria Falls and a short transfer I arrived to Kasane. This town is right in the “Four Courners” where four countries almost meet: Botswana, Namibia, Zambia & Zimbabwe. It is also the only town in northern Botswana. The next town Maun, is more than 600km away. Between these towns lies the wildest most beautiful wilderness with the Okavango Delta, one of the Seven Natural Wonders of Africa, as its protagonist. 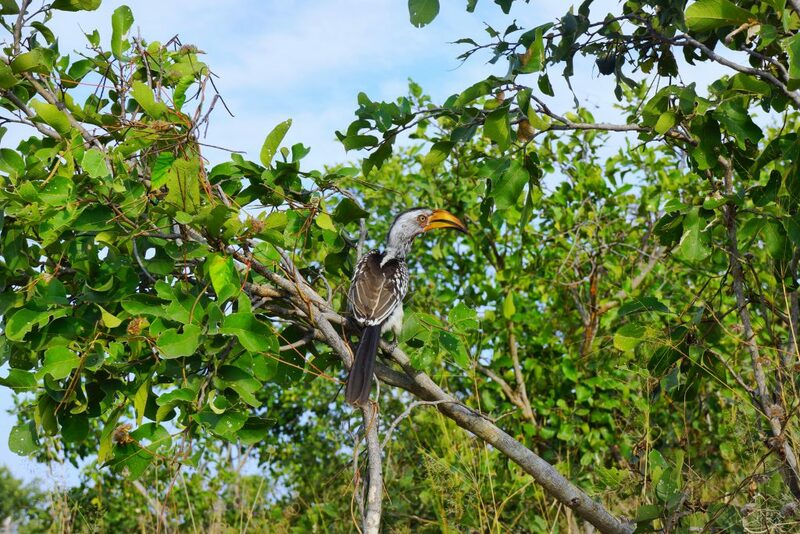 It all begins just a few kilometers south of Kasane in Chobe National Park, which benefits from one of the largest concentrations of wildlife in Africa. The Savuti, Linyanti and Chobe Riverfront areas within Chobe each offer different landscapes and unique game viewing. But that’s not all! The phenomenal wildlife experiences are continued in the Moremi Game Reserve. We left Kasane to soon enter Chobe National Park via the Sedudu Gate. Soon after the gate, rough and extremely sandy roads slowed us down. But we were in Chobe already! Our itinerary was tight. We would spend our first night in the Savuti Campsite in Chobe and second night in the Third Bridge Campsite in Moremi. But you’ll soon learn things had to change. What I’m trying to get at is: this is not for anyone. First of all, it requires an experienced and slightly fearless driver that is ok with driving a 4×4 in sand and mud. Second, it requires extreme preparation. 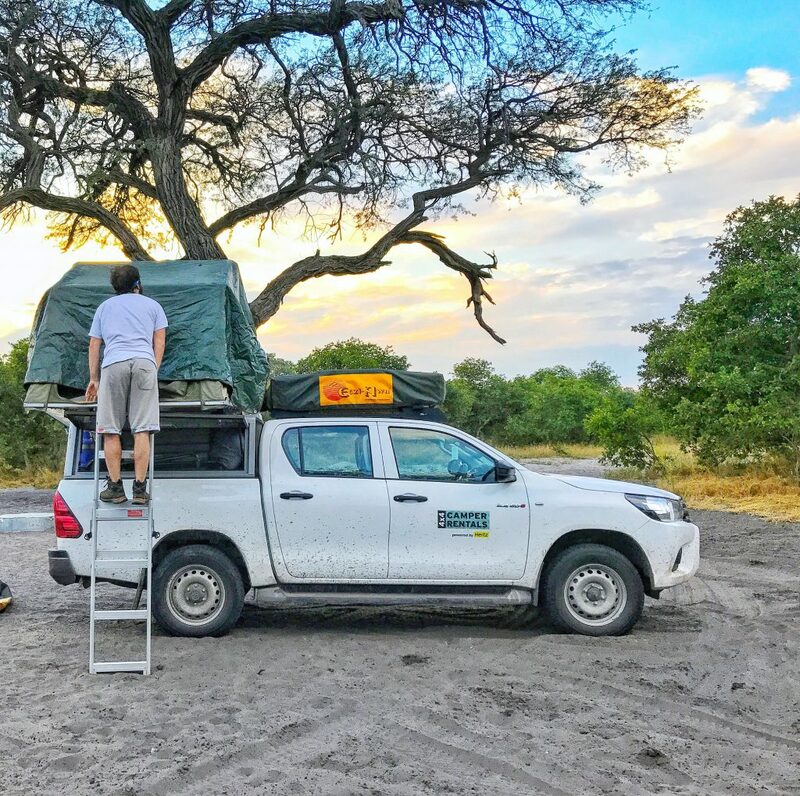 There is basically nothing between Chobe and Maun other than very rudimentary campsites so you’ll need to pack all the food, petrol, and tools required to survive your journey. We battled through the sands and got to Linyanti in the afternoon. There wasn’t much daylight time left but we wanted to spot some wildlife before heading to Savuti. We saw a herd of ten plus elephants up close. They were right on the middle of the road coming back from the river. We then headed to Savuti, and on our way found a couple of South Africans on a 4×2 stuck deep in the sand. Our attempts to tow them off all failed but luckily they had family in the camp and they came to the rescue! The next day we woke up and slowly began our journey towards Moremi. We soon saw an Impala herd completely frozen, watching something at a distance. A leopard had probably got one of their friends. Minutes after, Savuti continued to surprise us and we saw a pack of six or seven lions crossing the road, probably looking for their rest place for the day. Their arrogance and peacefulness represent their power: they are feared and they know it. We soon made our way for Moremi, seeing loads of wildlife on the way. Coming through y’all stop there! Moremi brought more widlife and obstacles. Our 4×4 got stuck in mud. Luckily, a local saved us pretty quickly and taught us how to handle the areas where you literally need to go through deep water. It was scary as hell but we did it. In parallel, the lovely and zero customer centered people at Third Bridge sent us, due to flooding, to Kaziikini Camp which is outside Moremi and on the way to Maun. They dis not give us any other choice. This meant we would need to leave Moremi a lot earlier than expected. Hence we decided to visit the Black Pools and Mogogelo Hippo Pool which are on the way to the South Gate of the park. While driving there we encountered and angry elephant who trumpeted loudly at us. Soon after we found a small waterhole with two elephants which seemed to be fighting inside it, together with hippos and a resting crocodile. At that moment I smiled to myself in joy: “Yep, this is what I’m here for”. We continued our journey and noticed the road became a lot rougher. The track was almost inexistent. A bit of erosion of the soil from wheels could still be seen but the space between the wheels featured grass a meter long. It was clear that not many cars had gone through that road recently. However, we continued and at last, the hippos! After the successful turnout, we decided to call it a day and head to Kaziikini Camp. It was a bit muddy around the pools, so we decided to take extra caution after having got stuck earlier. But we got stuck again! And this time we didn’t get out of it easily or safely. You can read the full survival story here. 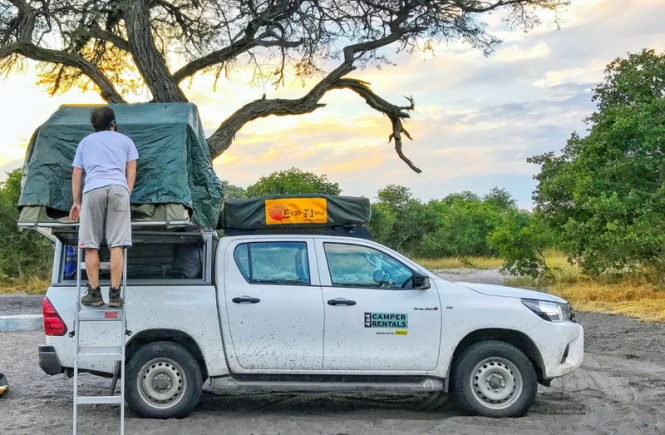 I hope I was able to convey this through the post, but I’ll say it anyways: self-drive safari in Botswana is where long days of travel in dodgy terrains are rewarded with uncharted wilderness. If you are adventurous, intrepid and passionate about wildlife in its most, well, wildest form then Botswana could be the experience of a lifetime. Are up to the challenge? Then you can find tips for planning the trip in this post. 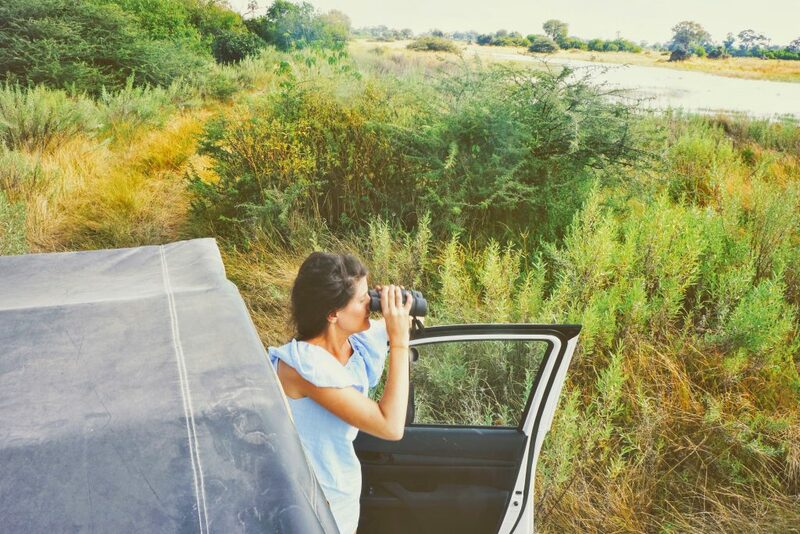 If you are looking for pure wilderness then self drive safari in Botswana can be a very rewarding experience. 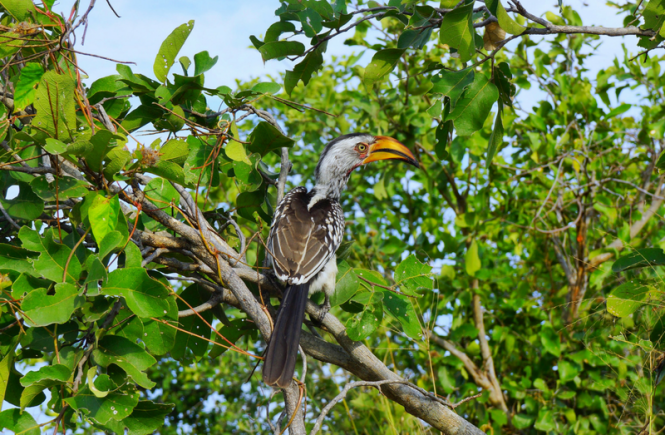 I visited the Chobe and Moremi reserves in the Okavango Delta – for details on my visit see this post – but there are a lot more National Parks & Game Reserves to explore such as the barren Central Kalahari Game Reserve which is next on my list. Please note, such uncharted wilderness comes with a price – you need to be prepared! There are several gates to the reserves, if you are coming from Kasane then you’ll approach Chobe National Park first. The road approaching Chobe is first a smooth concrete highway which then turns into, well, horrible sand. You need to be a confident driver to cruise these parks and in my opinion, a 4×4 is an absolute must. You could also come from the south (for example, Maun) and in that case you will enter Moremi first and go to Chobe after. Anyhow, you’ll need a good map. Cellphone reception is inexistent in the parks. Mobile data & wifi is pretty uncommon in northern Botswana so you’ll need to go back to basics. You can rent a GPS with you 4×4, the best option as it includes navigation. What I did was download the Tracks4Africa Botswana map in my phone and use it with GPS. This works well. I found the map to be – although not perfect – quite accurate. The good thing as well is that it has interest points, such as campsites, attractions, fuel and loads more, which are available offline. The points have a description and GPS coordinates. They did come useful at many points during the trip. Last, do carry a paper map just in case. I didn’t need it but you never know! We went in April, and it’s said that the best time to go for wildlife watching is April to October. The weather was perfect, it was quite hot during the day but not unbearable, and got chillier at night but not too cold. We stayed for 3 days and 2 nights, one in Chobe and one in Moremi. Three days is a lot less than recommended, but my partner and I are the energetic type who prefer to squeeze in as much as possible even if it means driving most of the day. We also didn’t mind the driving as it’s really all you are there for! If I had to recommend a time to go I would say at least 5 days. To be honest, the longer the better, as the chances to see animals hunting on prey or any other awesome wildlife episode will increase. 4×4: Although we did some people in 4x2s, guess what – they kept getting stuck! And I can tell you, getting stuck is not fun at all. We rented our 4×4 in Hertz Kasane and it was pretty awesome, but apparently Hertz is going to stop renting them in Kasane, so here’s an alternative. If you are coming from Maun you can use this rental instead. Food & drink: You need to take all the food, drink and water for the days you’ll be there. You should bring 4 liters of water per person per day. Our 4×4 had a proper fridge, which most do, so keeping food chilled shouldn’t be an issue. Extra fuel: There are no gas stations in Moremi or Chobe, which means you need to bring enough fuel for your whole safari. So bring extra fuel tanks. Some 4×4 have long range fuel tanks which house up to 140 liters which depending on your schedule may be enough. Fuel is sold in Khwai village in Moremi by the locals in their homes. However, they not always have it and it’s expensive. Satellite phone: As I mentioned there is no signal. A satellite phone seemed like an exaggeration to me but after this happened I will never do self safari again in my life without being able to call for help. It’s also better to travel in at least two vehicles. 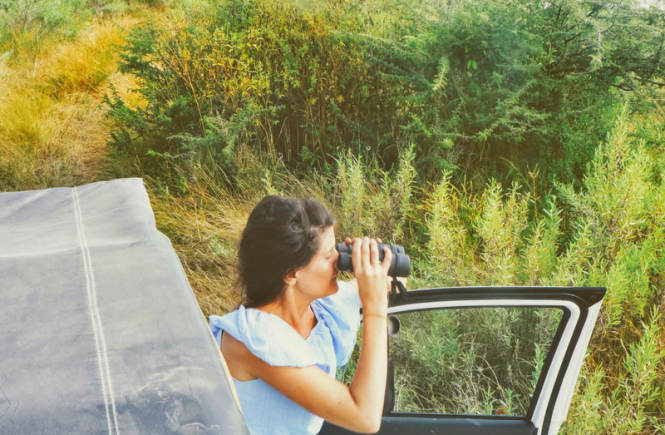 Because this isn’t always possible, bring a satellite phone! A dose of respect: Respect wildlife. Don’t get to close or do crazy things just for a picture. Don’t take unnecessary risks. A 4×4 preferably with two 4×4 modes, the second one being low speed full strength. It will come really useful in the sand. There are several campsites which you can chose from. You do need to pay and book in advance, and unfortunately they are not cheap nor customer friendly but that’s what happens when it is the only option you have. You need to book really in advance – I began booking more than 3 months before and I still didn’t get my first choice. We stayed at Savuti in Chobe for one night and booked the second night in Third Bridge but were actually relocated to a campsite outside Moremi called Kaziikini. We actually slept one night in the wild due to an unlucky accident. Park fees are payable in the gates so don’t worry about that in advance. Fees are valid from whenever you pay them to the next day at 11AM. Staff at the park gates are pretty useless when it comes to tips or help, so remember that you are on your own. Don’t let the requirements scare you, just make sure you are prepared. This trip will make memories that you will never forget. If you are looking for absolute wilderness then this is the place. Last you might also want to check out this Botswana Country Guide the lovely guys behind from Beard and Curly prepared as well. The majestic Victoria Falls, fed by the Zambezi River, are one of the Seven Natural Wonders. Although not the tallest or the highest, the combination of height and width makes them the largest sheet of falling water in the world. Trust me, you don’t wanna die without experiencing them, it’s a multisensory experience. Also, prepare yourself for the most beautiful rainbows you’ve ever seen! The falls are located in Zimbabwe and Zambia. You can chose to fly and stay in either! In Zambia, the city you would fly to is Livingstone and the airport is also called Livingstone. In Zimbabwe the town is called Victoria Falls and the airport well, Victoria Falls as well! 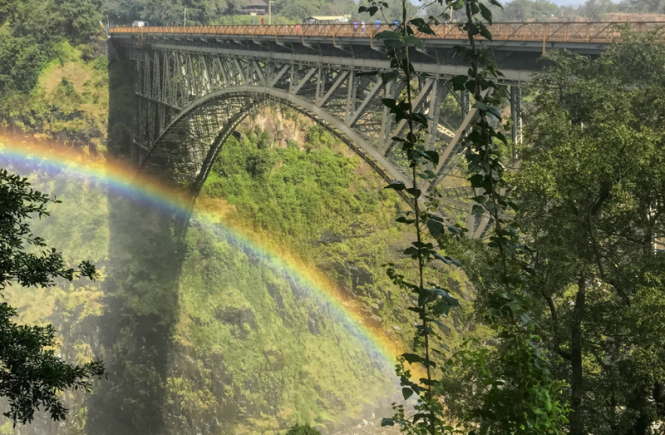 I stayed at the city of Victoria Falls in Zimbabwe and loved it! It’s a cute little town which at least near the falls is very touristy but still quiet. Plus, you will most likely be able to walk to the falls as they are so close to the town. Both to the Zimbabwe and Zambia side of them. Staying in Vic Falls is a no brainer! If you are as lucky as I was, you’ll see elephants feeding on your walk to the falls. This is not typical – the locals seemed pretty impressed. They were just passing by a few blocks away from the town center, feeding on the vegetation. Regarding hotels, if you are on a budget then stay in the N1 Hotel. It’s super nice, very cheap, super close to the falls, town and restaurants. If you can stretch a bit, then I’d recommend the Victoria Falls Hotel. This historic hotel with Edwardian style is truly beautiful and has a terrace with great views. If you are not staying there you can still stop by the Vic Falls Hotel for a Mojito! If none are available there are a couple more hotels (not a ton) which you can check out here. How many days do I need to visit the falls? If you are the active type and your only interest is the falls, one day is enough! You can easily do both sides of the falls – Zimbabwe and Zambia – in just a day and still not end up super tired. For the falls themselves you don’t really need more than two days to take them all in. The falls at full force, it’s a multisensory experience! Tell me about visiting the Victoria Falls? The falls in Zimbabwe and Zambia are two separate entities. This means they are separate from each other (about a 30 min walk which includes an immigration post) and you need to pay fees for each of them. Fees are valid for the day only (about 20 to 30 USD per person per park). To go to both countries you will also require a multivisa which you’ll need to pay for in the border. Most, but not all, countries can apply for a multivisa. Always check your visa requirements in advance. The time it takes to visit each of the falls’ parks is 2 to 3 hrs, so, as I said before you can fit them in a day. Please make sure you bring a raincoat or something waterproof for your valuables. YOU WILL GET WET. If you go in the wet season, very very wet. At first, it seems like the heaviest rain you’ve ever seen but it’s just the falls water mass bouncing everywhere. At some point, you cross a hanging bridge and feel the full power of the falls: you are standing in the bridge, a few centimeters of water running past your feet and so much water falling down you can’t keep your eyes open. It’s a unique experience. Unfortunately the excessive water prevented my GoPro from capturing it decently. In the drier months (Aug to Jan) you can do a trip to the Devil’s Pool and Livingstone Island. The Devil’s Pool is a natural rock pool formed right at the edge of the falls, which basically allows visitors to swim right at the edge of the falls without well, dying of a tragic death. Makes for pretty awesome pictures. I think I’d still prefer the wet season in order to see the full force of the huge mass of water falling down. Your choice! Other than the falls, Vic Falls town is nice to walk around and buy some souvenirs. There are various small markets with crafts. Elephant’s Walk was particularly charming. There are also loads of activities, which you can either book in advance or do so in the town or your hotel (everyone sells them!). Unless you are planning an overnight activity there is no need to book them in advance. There are many options: white water rafting, hi-wire gorge swing, zip line, canopy, canoe trails, crocodile diving, bungee jumping, helicopter over the falls etc. You can also chose to cruise through the Zambezi river with dinner & drinks included. Last, Vic Falls is really close to Botswana and the Chobe Game Reserve, both famous for it’s unique game viewing. You can arrange a day or multi-day safari to Chobe from Vic Falls or simply arrange one from the city of Kasane and take a transfer from Vic Falls to Kasane (which takes little over an hour). In my case, I decided to do self-drive safari in Chobe (only for the brave) and picked up my self-drive 4×4 in Kasane. Transfers to Kasane are expensive for such a short trip, I managed to find this one which was relatively cheap (35 USD PP). Literally just go to The Three Monkeys every night. It’s awesome. If you are vegan like me then they’ll do a vegan pizza. If you are not, there is well plenty of options like a trio of Wildebeest, Zebra and beef which my boyfriend is still talking about . Take a pic with the “I <3 Vic Falls” sign when you are there! Author’s note: Looking for other adventures in Africa? Botswana is just an hour from Victoria Falls. But beware! It’s only for those seeking thrill and adventurers. You can learn about it in this post.